While grease is obviously a pain for homeowners, you might think that we love grease. After all, grease gets us into people’s home for drain cleaning, and that makes us more money. But we’re not that kind of sewer service. While we’ll be your emergency plumber, we’re also your neighbors and have been for more than 75 years; we’re much more interested in helping you prevent those problems that we can and being there for you in your time of need for unpreventable problems. But let’s get back to grease. If you’re not sending grease and oil down your drain, what are you doing with it? We’ve given some ideas before, such as waiting for it to cool in the pan and then wiping it off with a paper towel and into the trash. But there are so many uses for grease and oil — some you can do in the home, some industrial — that you might want to reconsider before throwing it away. The simplest and most common use for kitchen grease is to cook with it. People have been cooking with grease for thousands of years, making foods tastier and finding a use for something that otherwise would have been thrown out. The downside to cooking with grease is pretty obvious, though…health issues. There are good oils and there are bad oils, and grease is one of those bad oils that will clog up your arteries (and no, your local plumber can’t clean out your arteries with a sewer jetter like we can with your drain pipes). So while lard might liven up those deep-fried french fries every so often, it’s best to not cook with it much. One good thing to do with grease is to recycle it. Unfortunately, it’s not as easy a pouring it into your recycling bin (we repeat: do not do this!). In Boulder county you can drop off grease and cooking oil at the Eco-Cycle Center for Hard-to-Recycle Materials at 6400 Arapahoe Rd. (303-444-6634). After Thanksgiving there are often cooking oil drop off locations around Denver. Depending on the demand, restaurants can pay to have yellow grease taken away or have a company pay them for it. Back when diesel fuel prices were getting to be around $4.00 a gallon, the yellow grease was very valuable because of people making it into biodiesel and driving their cars on it. While that demand has leveled off somewhat, yellow grease is still commonly used in the production of rubber, detergents. soap, and makeup. It is also used to feed livestock. 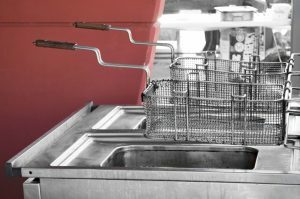 Grease has many uses, and the last thing you want is to have it clogging up your pipes and causing a demand for premature drain cleaning. Still, no matter how vigilant you are with preventing oils and grease from going down the drain, there will always be a buildup over the years that causes you to call your local plumber. When that time comes, Garvin’s will be there!